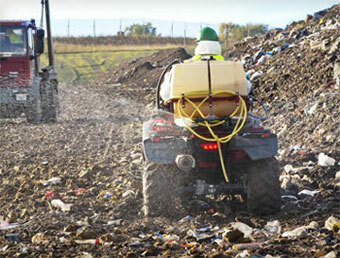 Effective control of flies is essential in landfill, waste transfer, recycling sites and other public locations, particularly to those near to residential areas. Most site owners operate a proactive programme of control to prevent the build up of problems which give rise to complaints and Environment Agency investigations. EcoPro offers a range of services tailored to the needs of the location, with monitoring and reporting to provide documentary evidence where required. We have a carefully selected range of products, up to the minute equipment and trained and experienced staff. We have partnered with Barrier Health Care to create an exclusive fly control product which has achieved excellent results. Rapid knockdown and residual treatments give effective long-term control. As a non-toxic product it can safely be used in areas which are open to public access and to ensure the safety of staff. EcoPro operatives can be stationed on site or make regular visits. For customers who wish to have their own in-house capability we can provide control products and protective equipment to ensure compliance with health and safety regulations. 4x4 quad bikes and sprayers fitted with the latest Magnum nozzles give rapid access to all exposed areas. Mist blowers produce powerful sprays which penetrate every nook and cranny. 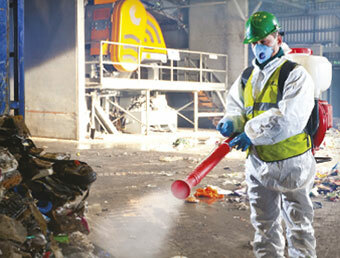 Back pack sprayers can also be used for specific small areas around offices or weighbridges. If you have a fly problem, a talk with EcoPro can lead to an effective solution. Contact us to discuss your needs.